Places to See & Things to Do on Cape Cod Without Breaking the Bank! One of my dear friends has a saying about our travel adventures in our younger years. She says, "We always had tons of fun on ounces of cash!" The great thing about vacationing on Cape Cod is that you, too, can have wonderful, memorable times - without breaking the bank. Bumper Cars and Batting Cages -- These classic Cape Cod activities from the 1960s are still going strong in the 21st century. Visit a family amusement center for mini-golf, batting cages, and bumper cars - then go for ice cream to top it all off. Open in-season. The Pirate Ship "Whydah" -- See treasures recovered from Captain "Black Sam" Bellamy's pirate ship, the Whydah on display at the Expedition Whydah Museum in West Yarmouth. Open seasonally. Water Taxis to the Beach -- Want to spend time relaxing on a peaceful, remote beach this summer? Take a shuttle boat to your own secluded stretch of sand. 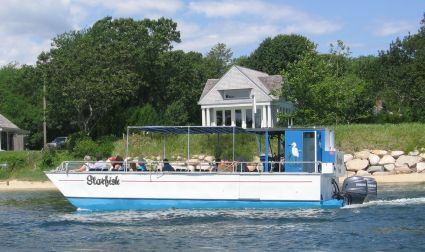 Shuttles from Chatham and Provincetown operate seasonally. Tour a Working 1654 Gristmill -- Go inside Dexter Gristmill in historic Sandwich Village and see the centuries-old mill grinding corn into meal. Be sure to buy a bag of freshly ground cornmeal to take home. It makes terrific muffins, breads and puddings! The Mill is open from May to October. Cape Cod Canal Cruises -- Take a sightseeing cruise or a sunset cocktail cruise aboard the M/V Viking from Onset Pier. Seasonal only. Ice Cream Sundae Floats -- Enjoy two popular Cape Cod activities at once - a boat ride and eating ice cream - on a Sunday afternoon cruise from Hyannis Harbor. This family oriented excursion includes all the fixins for a "create-your-own" Ben & Jerry's ice cream sundae! Late June to early September. Highland House Museum -- Visit this early 1900s seaside resort hotel in Truro and see guest rooms set up as though they were still occupied by ladies in flowing skirts and gentlemen in top hats. On the main floor at Highland House, there's a fascinating collection of memorabilia dating as far back as the arrival of the Pilgrims in the early 1600s. Open seasonally. Pilgrim Monument -- If you're up for some exercise with a spectacular reward, climb the 116 stairs and 60 ramps to the top of Provincetown's spectacular Pilgrim Monument. It's well worth the effort. On a clear day, you can see all the way to Boston! Open April - November.